A Sunday trip to visit a friend in Finchley, London saw me walk from Woodside Park Tube Station and along Lodge Lane. 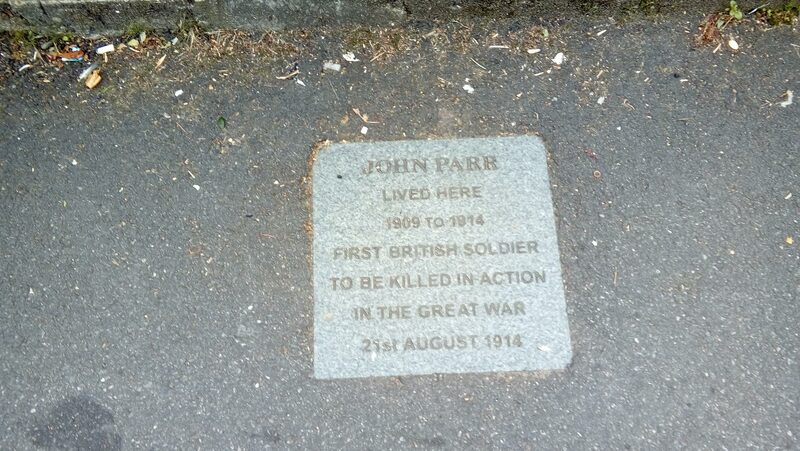 Although I nearly missed it, I spotted a plaque placed on the pavement in front of a modest house flagging up that the first British soldier to die in World War One spent most of his short life living there. Having lied about his age (he was too young) John Parr became a reconnaissance cyclist and on August 21, 1914 he and another made contact with a German Army cavalry unit patrolling ahead of their advancing forces at the Belgian Village of Obourg near Mons. 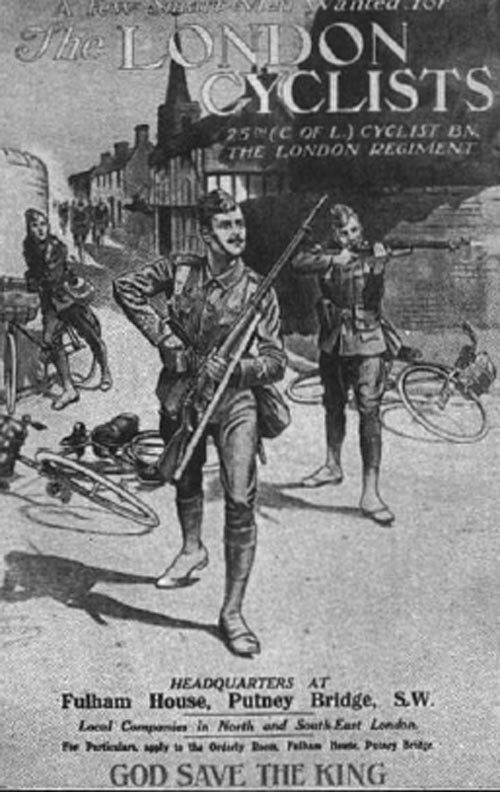 Whilst Parr stayed put to observe and engage the enemy, his companion sped away to alert the 4th Battalion of the Middlesex Regiment. Parr died in what is assumed was an exchange of fire and his death was not known for a long time because of the sweeping German advance. The unknown fate of John added to the heartbreak of his mother. Coincidentally Parr is buried in St Symphorien Military Cemetery in a plot a few metres away from where George Edwin Ellison lies and who was the last British Soldier to die in the war on 11 November 1918 (just 90 minutes before the armistice came into effect). Parr was 17 at his death although the gravestone says 20 and Ellison was 40. Additionally the last ‘Empire’ or Commonwealth Soldier to be die in action is also buried in the same cemetery and this was Canadian George Price who was killed on November 11 and only two minutes before peace was declared. Cycling battalions were an important element of the British Army and for instance it was the 11th Cyclist Battalion which went to support Allied troops atop the Kemmelberg, near Ypres in 1918. It should be noted that HMS Amphion on 6 August 1914 hit a mine and sank, with great loss of life and was the first naval ship to be lost in WW1.